view another article... This foot condition is the new back pain — it’s everywhereCarestream, CurveBeam to spread word about weight-bearing CTNew Cartiva ImplantPain Free Plantar FasciitisUFAI featured on ABC NewsCarolina Panthers Star Lotulelei's Foot InjuryFoot Surgery InnovationsBiggest Opportunities for Foot SurgeonsDoctors TV Show - Foot Surgery while Pregnant10 Diseases Your Feet Can Reveal, Readers DigestPlantar Fasciitis TreatmentsThe Doctors TV, Living with Plantar Faciatiis44 Ways to Correct Hallux ValgusDo fat-soled running shoes protect aging joints?Ankle replacement can restore mobilityCam Newton's Ankle InjuryMinimally invasive Foot & Ankle Surgery49ers' Crabtree 'amazing' Achilles recoveryAbout Kobe Bryant's Knee InjuryCurry more likely to play than Bryant3-D Scan Reveals Foot Damage by High HeelsAlbert Pujols' Foot InjuryWill Kobe Return? Doctors Raise Questions About Laker Star's Future In The NBAWhat Kobe must do to prove 'doubters' wrongKobe Bryant's difficult task ahead after injuryPau Gasol's return from foot injuryIs barefoot running a bad fad, or better choice?Born to Run Barefoot?Born to run barefoot? Some end up getting injuredCan a $15 basketball shoe have game? Treat it right: See a doctor as soon as you suspect a problem...you may be able to control the OA with shoes that are long enough and have a deep enough toe box to keep your big toe from rubbing against the side of the shoe. A rigid sole should also help, as it prevents your big toe from bending and twisting. The foot is an engineering marvel—26 bones, 33 joints, and more than 100 tendons, ligaments, and muscles that support your body for a lifetime. Instead of coddling our feet, though, many of us make their difficult job even harder. We all know about stressors such as badly fitting shoes and high heels. But did you know that excess weight is also tough on your feet? A study of people who lost an average of 90 pounds after bariatric surgery found that their foot pain complaints dropped 83 per cent. Here are common aches and pains—and easy foot pain cures to keep your feet healthy and strong. Though experts don’t know how many people have OA of the big toe, they agree it is more common as we pass the half-century mark. “Because you push off the big toe with every step, it gets lots of wear and tear,” explains Erika Schwartz, DPM, a spokesperson for the American Podiatric Medical Association. 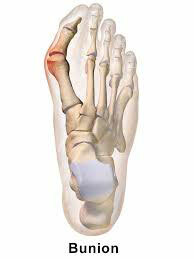 As the joint’s cartilage wears down, it may feel stiff or hurt when you walk, a condition dubbed hallux limitus. 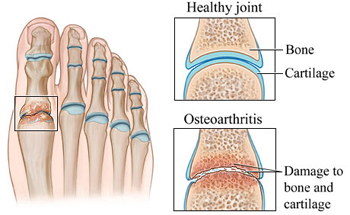 Eventually, the joint may stop moving altogether, a painful condition called hallux rigidus. Some people also develop an overgrowth of bone, or a bone spur, on top of the joint, which many patients mistake for a bunion. Treat it right: See a doctor as soon as you suspect a problem, says Bob Baravarian, MD, codirector of the University Foot and Ankle Institute in Los Angeles. At this point, he says, you may be able to control the OA with shoes that are long enough and have a deep enough toe box to keep your big toe from rubbing against the side of the shoe. A rigid sole should also help, as it prevents your big toe from bending and twisting. At an early stage, exercises help you regain range of motion, says Hylton Menz, PhD, editor-in-chief of the Journal of Foot and Ankle Research. His recommendation is to place a towel on the floor and put your foot on it, keeping your heel flush with the towel’s near edge. Using your toes, grip the fabric, moving it bit by bit toward your heel. Repeat five times. Do this three times a week until symptoms subside. You can also ask your doctor about OTC or prescription shoe inserts and medication, such as ibuprofen or a cortisone injection. Surgery is another option, says Baravarian. Depending on the type of operation you have, recovery time can vary from one to two months. This bony bump forms at the base of the joint and pushes the big toe against the others, causing swelling, soreness, or thickening of the skin, as well as limited movement. Your genes predispose you to bunions (also called hallux valgus), but tight shoes and high heels could also be a cause. Though you can develop a bunion at any age if you’re genetically predisposed (or if you’ve really abused your feet), the likelihood is more common as you get older. One study found that women in their 40s were one-and-a-half times more likely to have bunions than 30-somethings. Those in their 50s were three-and-a-half times more likely, from 60 to 69, the likelihood rose to six times. Treat it right: When the big toe starts drifting inward, you might be able to coax it back to its normal position and keep a bunion from developing, says Menz, who is also director of the Musculo-skeletal Research Center at La Trobe University in Australia. He suggests sitting down, placing your feet side by side, and looping a thick elastic band around your big toes. Slowly pull your feet apart to tighten the elastic. Hold for 20 seconds. Repeat ten times. Do three sets once a day, every day, to maintain the improvement. You can also try a flexible splint, such as Bunion Aid (alphaorthotics.com), which can reduce mild displacement of the big toe. Menz warns that such devices do not cure bunions but simply help while they’re being used. If conservative measures don’t solve the problem, you could be a candidate for several types of outpatient bunion surgery. Recovery varies from a few weeks to two months, depending on the procedure you have. The cushiony fat pads in your heels can lose some of their elasticity due to aging or excess weight. The result is inflammation and a dull, chronic ache in the centre of your heel, says Menz. Treat it right: He suggests wearing comfortable flats and using an OTC heel pad or heel cup in your shoe for extra cushioning. Or try icing, says Baravarian, who explains that chilling your heel reduces the inflammation that’s causing the discomfort. For a quickie way to ice, freeze a plastic bottle filled with water, he says. Place the bottle on the floor, and roll your heel and foot over it for about ten minutes a day until the discomfort subsides. Are your toenails at risk? Fully 65 per cent of people age 65 and older have thick toenails, making it one of the most common foot problems. Once nails thicken, they can even separate painfully from the toe bed. The prime culprit is athlete’s foot, or tinea pedis, which can hang out in your shoes for years before causing symptoms. To fight a mild infection and begin growing new, thinner nails, you may need an OTC or prescription topical antifungal preparation. If topicals don’t work, the next step may be prescription oral medication.